Do you find June to be crazy busy? Every year I try to slow it down a bit, but there always seems to be so much to do, and this year is no exception. As you can tell by the lack of posts, my time has been consumed with client projects, our basement renovation, outdoor projects, regular household stuff and family time. With my husband traveling for work more than usual in May (let’s just say almost the entire month! ), as well as spring football camp, assignments and exam preparation for my son, it has been a whirlwind around here! 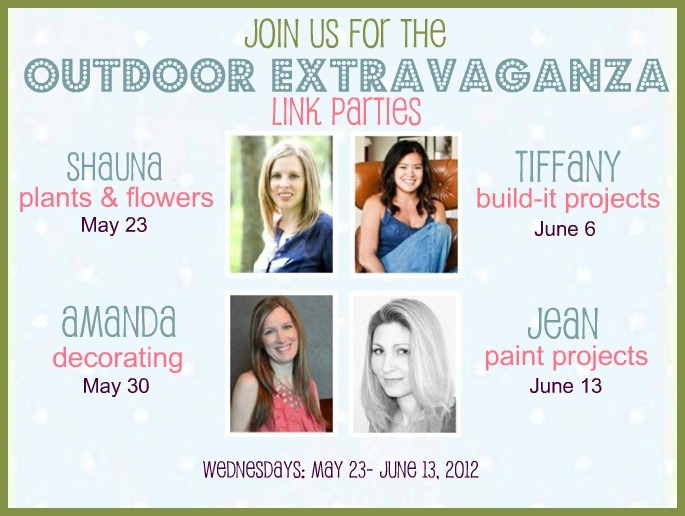 Today, I insisted on taking a quick break from everything to remind you to get your Outdoor Build-it Projects ready to link up over at Tiffany’s tomorrow for the Outdoor Extravaganza. I can’t wait to share one of our big projects that required a lot of power tools, man/kid/woman power, and patience…but was well worth it! I so totally get what you’re saying, Shauna about the craziness of May. I have a line-up of painting projects, and a list of commitments, and little to no time to do! So my posting has reduced. It seems like there is a lot going on for everyone out there right now! It’s just nice to connect when we do!